New to Raz-Kids? Watch our quick video introduction! 400+ eBooks and open-book eQuizzes, with new books added every month, even in Spanish! Access for Students: With Raz-Kids, students can practice reading anytime, anywhere - at home, on the go, and even during the summer! Results: Viewing reports is simple, for individuals, classrooms, schools and even districts! Raz-Kids is now on the iPhone, and iPod Touch! 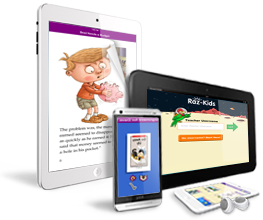 On top of being accessible 24/7 via the Web, Raz-Kids also delivers reading access through its free apps, meaning your students can read and take quizzes on their iPad, Android, and Kindle Fire tablets. All student activity in the app is captured and reported to teachers at Raz-Kids.com, thus helping teachers monitor student progress and determine the instruction needed for each student. "Now that we have Raz-Kids up-and-running, the kids are excited, parents think it's awesome, and teachers are thrilled!"